Open source code, just some files encrypted so it is easy to customize according to your needs. Price : $294.12 $205.88 (Discount 30%) Limited offer! 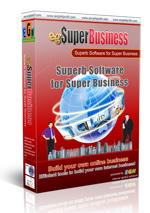 A Superb Software for your Super Business! egSuperBusiness is a Network Marketing Software written in PHP, Using this software you will be able to build online business with unique payplans. Work with Powerline/ Pass-Up, Pool bonus, Sponsor bonus, Network bonus (Revolving matrix, VIP matrix, Regular matrix working simultaneous), and Advertising Program. All those features can be run in one website. You as internet preneur will be helped because you don't need creating products to sell, Use the Advertising Program as your services while give your members and you more income streams by the Network Marketing Plans. Great Network Marketing Plans: Revolving matrix, VIP matrix, Regular matrix, Pool bonus, Pass-up bonus, Sponsor bonus, Reward point, etc. Can be easily configured (enable/ disable) for each feature. Great Advertising Features: Classified Ads, Banner Ads, Text Ads & Solo Ads with feature of shop ad packages. Can be easily configured (enable/ disable). Great Investment Features: Unlimited investment packages with advanced configurable options. Can be easily configured (enable/ disable). Facebook Registration, Your visitors can be easily register to your website using their Facebook account. Internal Support Ticketing System. No need to install third party support ticket software, because you own it! Content Management System. Now will be very easy to change the content of your website, using the 'Online Content Editor' you can edit your website content online in Admin Area. So it will greatly save your time and effort, even for ordinary people will be able to edit their website content or creating new pages by themselves. Landing Pages Management. You can create unlimited landing pages to promote your website by you or your members. Image Manager. Changing images on the website can be a difficult job. But in egSuperBusiness it becomes very easy using the Image Manager to upload your image or your company logo. Uploading images is no longer done by manually! Banner Manager. You can place promotional banner images on the front page also in member area automatically, even comes with a Banner Rotator feature. We guarantee that your website will be more interesting! Easy To Design. egSuperBusiness is working with smarty template system so it is easy to work with html codes using any standard html editor. You will be able to design easier, add more links or page without any restriction. We provide 6 Free Templates with the product package that you can use to beautify your website. SMS Notification, using email to Sms provider to notify your members using Short Message Service ( SMS ). Multiple Admin with Level Access. Your website can be maintained by several Admin, and you can specify the level access allowed for each Admin type , so that you can create a team to run your online business activities. Easy web based administration, all management is done through your browser, come with a complete control for each feature available easily in Admin Area. Automatic Activation and withdrawal for payment method which supports Instant Payment Notification. Subscription Membership. egSuperBusiness can handle of subscription period such as Daily, Weekly, Monthly or Yearly. The membership handled automatically. Payment & Withdrawal Plugins. An open source code php files which work with Payment Processors, so you will be able to create another payment plugins. Advance Wallet System, Can work with separate wallet of each payment processor or in one wallet for each payment processor. Support Multi Languages, you can add any new languages or edit the current language to your own custom language by editing the translation file. Multi Language Email Notification, such as welcome email, sponsor notification, membership activation, forgot password, membership expired, earning notification and others. Custom Member Fields. Able to add another field for member information, also set the required fields on registration or member profile. Registration Validation email. If you need new members to confirm their email address by sending a confirmation/ validation email. Auto Email, Can be used as Autoresponder/ Auto follow up facility to inactive members and active members. egSuperBusiness can work with multiple matrix at once such as Revolving matrix, VIP matrix, Regular matrix works simultaneous. You can set the configuration of each matrix such as depth, width and the level commissions. Also can be enable or disable the matrix plan. VIP Matrix, Beside income from the Revolving matrix, your members will also earn money from the VIP Matrix. By this matrix your members will also earn money for new members enroll, shop ad packages and purchasing deposit plans. Regular Matrix, Free members and Paid members will be placed into this matrix if they refer new Paid members. Members in this matrix can be earn bonus for downline upgrade, orders and deposits, Both your members will be earning income! Pool bonus, If you want to share your revenue to your members you can give them bonus with daily, weekly, monthly or yearly basis. Powerline/ Pass Up, can be set to any amount of pass-up plan. Sponsor bonus, Commission to your members when they enroll new members. Reward Point, Can be used as a bonus or special offer for the outstanding member. Each bonus name can be renamed to suit your needs. Each matrix can be configured, width and depth can be determined freely (nXn) and set the commission for each level. Pay commission to sponsor and the network for new members enroll, ads shops and investment program. The commissions can be easily configured. Genealogy tree for each matrix plan is available. Everybody knows, product is absolutely needed to create a business. Providing product may be the hardest part for online business, but with egSuperBusiness you can easily provide Advertising service as your product, so nobody will say your business is money game! Ads Bidding System. Set the minimum cost (in credits) and let your members decide how much they bid for ad impression, is the best strategy for advertisements. Buy Ad Credits. Your members are able to shop more Ad credits using their account balance. Network Commissions. Pay commission to sponsor and they network for Ad credits shops. Easy Ad placement. You can place ads anywhere! Easy... by writing simple code to any page you wish then the ads system will work automatically. Unlimited Classified Ads Package with configurable options such as Categories, Display duration, Additional field, Ad Detail and more.. Unlimited Banner Ads Package, you can specify the banner dimesion of each ad package. Easy Text Ads Design, set the colors for displaying Text Ads. Solo Ads, displaying a full website advertisement. Optional features included in egSuperBusiness package. You can provide additional income to your members by the investment features! Unlimited Packages. Create unlimited plan with configurable options. Multiple Interest Rate. You can set the interest rate for each deposit amount range. Unlimited Payout Plan. You can set how many times the profit will be paid, up to unlimited. Compounding. Set Enable or Disable compounding with specific amount allowed and Members can change their compounding percentage anytime. Cancellation. Set Enable or Disable deposit cancellation with time range allowed. Working Days. Set the working days of each investment package, so you will be able to select which days the profit will be paid. Plan Limitation. Able to set membership restriction for investment packages. Manual Profit Payment. Able to see which deposits needed to pay and perform profit payment manually. Automatic Profit Payment. Pay profit automatically by system using automation program. Dinamic Interest rate. You can change the profit interest rate when paying profit manually. Deposit Default Status. You can set the default status of new deposit (On hold or Running). Bonus/ Testing Plan. Create a deposit for testing/bonus/giveaway purpose. Signup Bonus. Able to give any amount to new member joined as a locked balance. The balance is restricted to use with the Bonus/Testing Plan only. This feature will create a massive new members for your program! Add Fund Commission. You can give commission to members when their downlines perform add fund. Deposit Referral Commission. You can give commission to members when their downlines create new deposit. Deposit Level Commission. You can give commission to members network on new deposit created. Commission Limitation. You can set how the commission will be paid (repeatable or non repeatable) and you can also give free member commission. Income Calculator. Using Deposit Simulation, your members are able to see how they deposit will be run and calculate the profit will be earned. Deposit Logs. Members are able to see their deposit history including the profit payments. Email and SMS notification. You can set email notification and even a SMS notification to your members notifying their deposit activities.